It's a big claim to call your product "The World's Best." But we know that after you have used the Wonder Junior hand mill that you will agree. For years hand grain mills have either been really cheap or really expensive. And unfortunately their ability to perform has been directly related to their cost. The cheap ones perform poorly and the expensive ones perform great. When we designed the Wonder Junior we set out to create the perfect storm in hand mills . We also wanted the versatility and high quality of the most expensive hand mills in a price range that was affordable to the homemaker. We found the perfect storm with the Wonder Junior Deluxe. What Elements Are Needed to Create the Perfect Storm? Although our mill is USA Designed and Patented, finding a mill manufacturer to produce it to our demanding standards was no easy task. Because of this reason we turned to the country that produces more mills and has more expertise in Milling than any other country in the World. That country is India . It is a historical fact that some of the Worlds finest mills and finest mill craftsmen are from India . We not only chose India but we chose the best manufacturer in India to produce our Wonder Junior hand mill. Along with the best manufacturing and design we also use the highest quality materials to insure that this grain mill will be around for generations of use. Of the many hand mills on the market today there is no other hand mill that can perform all the tasks that the Wonder Junior hand mill can. Not only can the Wonder Junior hand mill perform more tasks but it does those tasks more effectively than all other mills. The Wondermil Junior hand mill can grind flour faster than any other hand mill. It can crack grains or produce pastry fine flour with one pass. It can grind spices, herbs, oily grains (like flax or coffee), and makes smooth and delicious nut butters (see WillItGrind.com for more info). One of the most important requirements in a manual grain mill is that it is easy to set up and use- This was very important in our design. We didn't want separate plastic hoppers or lock pins and springs that can easily be lost or misplaced. Because of this we designed the sturdy one piece I Beam Uni-Body Mill, with the heavy duty bearings, solid steel shaft auger, and heavy double post clamp. The Wonder Junior is the easiest to use as well as the most rugged hand mill on the market. With the quick change head system you can switch from grinding dry grains, beans and legumes to oily grains, nuts and even coffee in just a couple of minutes. Nothing is more simple than the Wonder Junior Deluxe hand mill. With the NEW grain auger we implemented at the beginning of 2011, the Wonder Junior hand mill is much more aggressive at getting the job done fast. In a test performed at the WonderMill test kitchen, the Wonder Junior was able to grind 1 ¼ cups of flour in a single minute *80 turns*. (This is 65% (about 1/2 cup) more than we were able to produce with the Country Living grain mill with the same flour setting and the same amount of turns *80 turns*, and for half the price. Not only does the Wonder Junior Deluxe wheat grinder have a strong and secure table clamp that blows its competition away, but it now comes with a flour guide and cleaning brush to keep grinding mess to a minimum. This makes cleanup a breeze. This NEW flour guide effectively guides the flour to fall into you container, instead of all over your table. Many expensive hand mills are quite heavy and large making them harder to set up, take down, and store. In fact many expensive hand mills require you to bolt them down, leaving holes in your table. This is not the case with the Wonder Junior. It weighs only 10 pounds, it is half the size of its expensive competitors, and comes with a sturdy and convenient table clamp to make using it convenient and simple. The Wonder Junior can also be motorized to allow you to be creative and more efficient. A motorizing pulley is available from authorized dealers. Motorizing your Wonder Junior will void its warranty but it gives you more flexibility to do what you want. 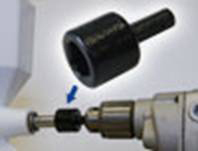 Even better than motorizing your hand mill is our NEW Drill Bit Attachment. Now you can power the Wonder Junior with your high powered drill, available from authorized dealers. Not only does the Wonder Junior Deluxe hand mill grind dry wheat and grains, it can grind many of the more oily grains and seeds. It can even mill spices, cloves, coffee beans, flax, and so on..... (go to WillItGrind.com to see more of what it can grind). 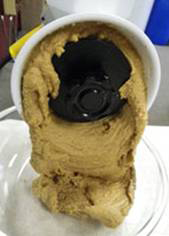 And with its new aggressive grain auger, it can do nut butters better than hand any other hand grain mill on the Market. We have already mentioned the superiority of the Wonder Junior Deluxe's table mount but its benefits do not end there. When compared to the competition in its price range, the Wonder Junior is thicker and wider in its body mold and it has no plastic parts. It's only non-metal parts are the nylon hand grips, clamp and adjustment knob, leaving it strong where it counts. The Wonder Junior's stone burrs are not only thicker than the competitions' but it also has a metal backing to keep it from cracking in shipping, accidents, and every day use. You can be assured that this hand mill is built to give you a lifetime of use. The Wonder Junior hand grain mill also comes with a Limited Lifetime Warranty to put you mind at ease. The really cheap hand mills are usually a disappointment and fall far short of the mark of really performing any of their stated claims. Those slightly cheaper than the Wonder Junior Deluxe fall short of the quality, durability, versatility and the convenience that the Wonder Junior Deluxe offers. Buying a more expensive hand mill than the Wonder Junior Deluxe doesn't make any sense. Do you really want to pay two to three times as much for a more expensive hand mill that is not any more durable than the Wonder Junior or can accomplish what the Wonder Junior Deluxe can. The Wonder Junior Deluxe gives you everything you need and more. The Wonder Junior Deluxe is HANDS DOWN the Best hand grain mill you can buy for your money.